Yes, that’s right: A cruise vacation can be a healthy vacation. Sure, a generation or so ago, a cruise vacation was often an excuse to drink too much and overeat, not only during breakfast, lunch and dinner — but also at the legendary midnight buffets. Today’s health-conscious traveler will find it easy to eat well (and deliciously) on a cruise and drink fine wines, without overindulging. Exercise options onboard can be fun and there is enough to do so there is little risk of eating out of boredom. Cruise Lines International Association (CLIA) recently listed the following 12 reasons why taking a cruise is a healthy vacation choice, based on a 2014 North American Cruise Profile study, which collected data from U.S. and Canadian residents. Sunshine: There’s no better place to enjoy the morning sunshine than a cruise ship deck. Studies have found that getting an hour of natural sunlight in the morning can help fine tune your internal clock, allowing you to get more (and better!) sleep. Sunshine also has long-term benefits since it helps the body produce the important Vitamin D which has been found to help fight off heart disease and cancer. Moderate amounts of sunshine will also boost serotonin levels that fight off depression. So apply sunscreen and enjoy the rays! Relaxation: Finding time to relax plays a vital role in overall health. Chronic stress can lead to a myriad of problems, including impaired memory, inflammation, high blood pressure and heart disease. Skip the stress by lounging at the pool, enjoying spa treatments and relaxing in comfortable accommodations. Best of all, cruising allows for a stress-free vacation experience where vacationers can just “go with the flow” of the itinerary. Cleanliness: Cruise line cleanliness is highly regulated. Each room and common area is kept clean, presentable and disinfected. From door handles to poker chips, cruise ships are regularly sanitized for the well-being of everyone on board. Clean hands also guide a steady ship, as those on-board are urged to wash hands frequently. Ocean Air: The benefits of fresh, ocean air are seemingly limitless and cruisers can take full advantage day and night. Between daytime excursions and nights spent relaxing on the ship deck, there is plenty of time to breathe deeply! Fresh air is known to help keep lungs clean; aid in digestion; improve heart rate; strengthen the immune system; and provide an energy boost. Salt Water: Isak Dinesen knew what she was talking about when she said, “The cure for anything is salt water: sweat, tears or the sea.” Cruisers can take full advantage of the amazing benefits of the ocean. Aside from the stress relief a day at the beach provides, swimming in salt water can also help improve circulation by restoring vital minerals to your body. Ocean water and on-ship salt water swimming pools are also a natural beauty treatment, as the magnesium has been found to help hydrate skin and improve inflamed or red complexions. Camaraderie: Humans are wired to connect with one another and in our hyper-digital age, this isn’t always a daily reality. Cruising allows for high amounts of quality bonding time with your vacation partners while also allowing you to socialize with new people. Whether over a gourmet dinner in the dining room or during a comedy routine in the ship theater, cruise ships offer time to connect with others free of work emails, smart phones and hand-held gaming systems. Exploration: There’s something to be said about the benefits of exploration and having an adventure (not to mention the stories to tell!). Pre-planned cruise shore excursions allow cruisers to scuba dive, parasail, check out local sites in exotic locations and more, without the stress of making planning every detail or reading millions of reviews to find the right activities. Cruisers can see the world without spending months planning. Healthy Dining Options: Though many people think it is impossible to eat well while on vacation, cruise ships around the world offer healthy dining fare and lighter meal options to accommodate every diet. Gluten-free? Vegan? Low-carb diet? Cruise ship chefs are happy to accommodate. Additionally, cruise ships offer buffets filled with fresh fruits, vegetables and lean proteins to help you build a better plate. Staying Active: Cruise vacations offer vacationers a chance to stay active. There are plenty of onboard activities, like rock climbing, basketball or table tennis. In addition, many cruise ships offer full service gyms and fun fitness classes like yoga in the morning or nighttime tai chi. 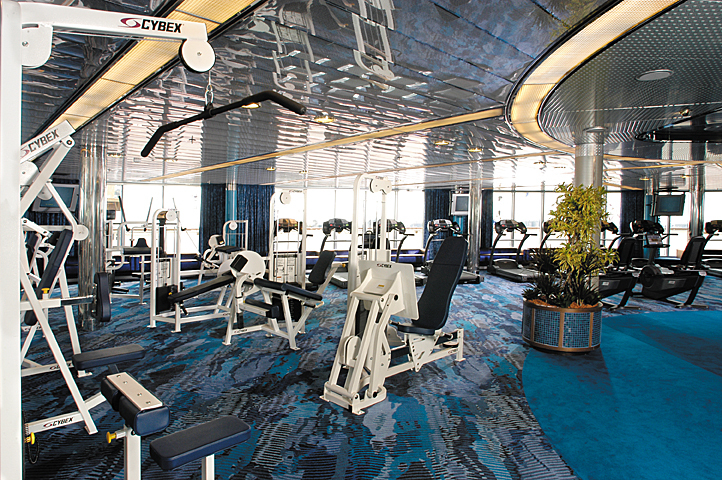 It’s easy to stay active with options abound on each ship. Meditation: Whether packing a dance card with endless excursions or take a leisurely stroll around the port, “think time” on a cruise can help clear the mind. Meditation has been found to help reduce stress, negative emotions, recharge the mind and increase self-awareness. Nothing takes the mind to a peaceful place like gazing into open waters or meditating in a beach chair. Stress-Free Vacation Planning: Vacations are important in terms of “getting away” and bonding with loved ones but the stress of planning every detail can be daunting. Cruising allows for stress-free vacation planning with pre-planned excursions, inclusive meals and endless on-ship entertainment. More importantly, a cruise vacation allows you to unpack and get settled in your cabin without the hassle of having to move your belongings, while you visit multiple destinations. Better Budget Value: Nothing can bring down a vacation high quite like returning to a pile of credit card bills. Cruise vacations are a great all-inclusive way to enjoy a variety of vacation experiences without a variety of hidden costs. Cruise travel agents are also available to help budget and pre-plan trips for the most budget-friendly experiences.